SSL stands for “Secure Sockets Layer.” SSL ensures that your website and your visitor are communicating securely by encrypting the data moving between your site (Sierra.host’s servers) and your visitors computer or device. SSL isn’t just important for security reasons but Google has begun prioritizing sites that utilize SSL technology. Chrome, Firefox and Safari all alert users when a site does not use SSL. SSL requires a certificate to be installed on your website hosting account. The certificate helps the visitor’s web browser to know who its communicating with and function as a seal of authenticity and unique identity of your website. 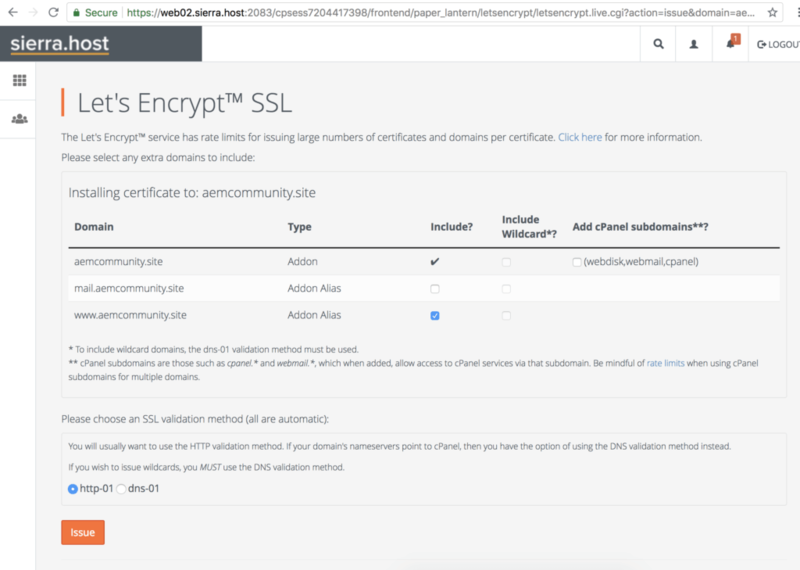 Sierra.host offers free LetsEncrypt SSL certificates for every website you have with Sierra.host. Installation is easy and just requires you to go through the 5 minute process. From this next screen you can select the domain or sub-domain you’re going to power up with SSL! Just click the +Issue button on the appropriate row. If you have more questions or in the rare event that your domain isn’t validating, contact us. If you’ve got an existing WordPress website, here’s how you can configure your WordPress website to take advantage of your recently installed SSL certificate.